Cream butter using a mixer fitted with a paddle attachment on medium speed. Add sugar and beat until smooth. Add the egg and egg yolk one at a time. Add vanilla and mix until incorporated. Combine flour, salt and ground walnuts in a separate bowl and whisk until uniform. Slowly add flour mixture to the butter. Mix until dough pulls away from the side of the bowl. Knead a few times and chill dough 1 hour. Preheat oven to 350° F, and lightly grease a cookie sheet or line with parchment paper. Roll dough into 1-inch balls. Place on prepared cookie sheet 2-inches apart. Make an indentation in the center of each ball with your thumb or the handle of a wooden spoon. 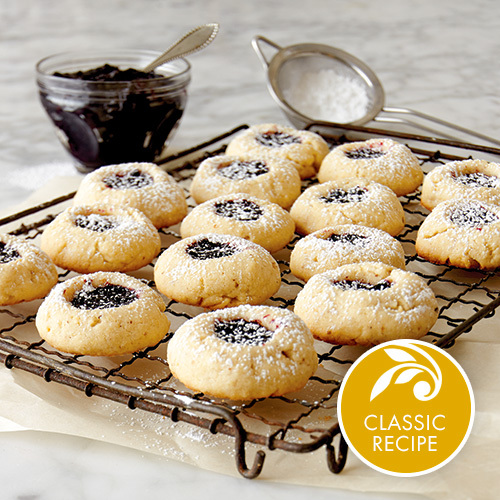 Fill each cookie with a generous 1/4 teaspoon of jam. Bake until edges are golden brown, about 14-15 minutes. Remove from oven and allow cookies to rest for a minute before transferring to a rack to cool. Top with additional jam if desired.